It may be a little difficult to style your bump to the office but in the summer it’s even more difficult because it’s hot and future moms need much more comfort, so you should take a lot of things into consideration – fashion, fabrics, prints and so on. Plus, we all strive for colors and prints in the summer, so how to consider it all and dress with style? Enjoy the ideas below! A dress is the most popular piece for any future mom because it doesn’t hamper and it’s very easy to style. Choose any dress that you love and that fits your dress code, if you ask me, I’d vote for a wrap and a shirt dress because they are incredibly comfy to wear and they are timeless. As it’s summer, you can opt for bold prints and colors if they are allowed, or make a colorful statement with bold shoes or flats. A skirt will be also easy to style, it can be a pleated or printed one, and I’d recommend a mini or knee length one to feel comfortable. 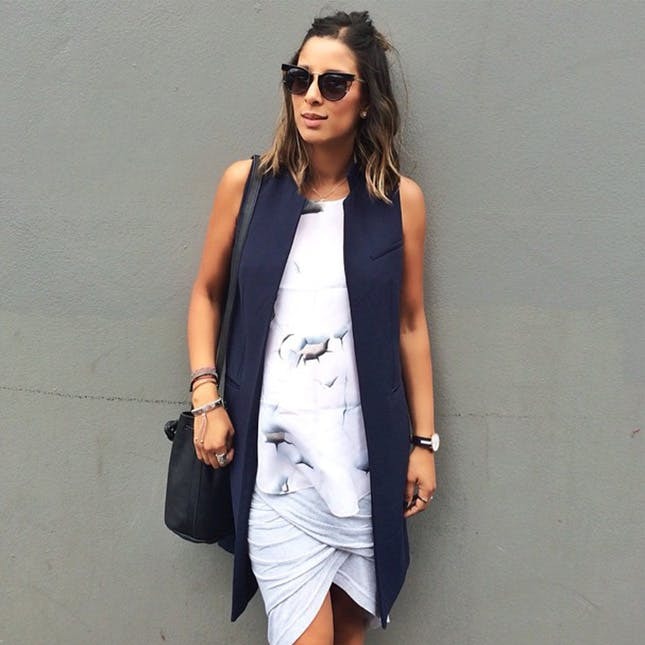 A long vest will visually make your body longer and fitter, so you can add this detail to your skirt look, too. Culottes and wide pants are welcome, they are in trend now and won’t hamper also. Get inspired!